These days, many shoppers look past retail stores and search for individuals selling their personal clothing online. Many individuals choose to sell their never worn or lightly worn clothing online as means of making money. These transactions have recently been facilitated through social media such as online forums, Facebook groups, and Instagram. With the rise of this concept of online thrift shopping, we wanted to develop a more efficient means of buying and selling personal articles of clothing. This application serves to create a community for fashion bloggers and fans to share their inventory of clothing items and accessories through “look book” style photographs of their outfits. Furthermore, the application has a “marketplace” aspect which allows users to sell and bid on each other’s clothing items as seen on their “blog”. 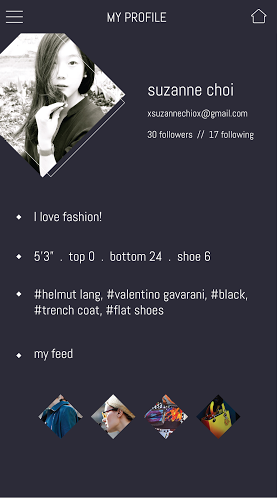 Each user creates a fashion profile that specifies their style preferences, favorite brands, and size information such as height, dress size, etc. Based on this information, users will have a personalized feed that scrolls infinitely (like Tumblr and Pinterest) through photographs of outfits of users they follow, styles they like, and other search specifications. Each post on the feed consists of the name of the user posting the outfit, a picture of the outfit (the main portion of the post), and touch options that allows users to Like, Comment, or Bid/Buy clothing pieces seen in the picture. We tested our application several times throughout the design and development process. With each iteration, we drew from user feedback, reflected on new ideas, and made changes we saw appropriate. This was done via wireframes with a paper prototype methodology. This mainly done to ensure we were not missing any screens in terms of usability. Additionally we wanted to gather a better sense of whether the flow of interaction was intuitive and natural. After editing our initial wireframes, we wanted to see whether our visual language was communicated throughout the application using an initial, static design of our product. 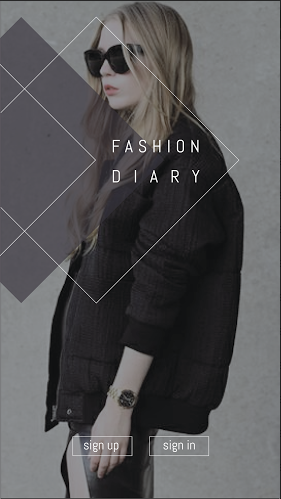 Our application was to appeal to fashion enthusiasts so visual aesthetics and design were extremely important. After development of our application, we wanted to ensure there were no technical bugs or edge cases that may appear. Our final stage of testing was mainly to monitor interaction flow and general usability of the developed application. The storyboards to the right display the screens we designed for each step of the application. 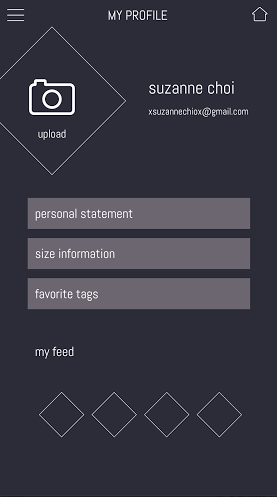 Each user has their own unique profile with information about their specifications for clothing such as height and size for clothing as well as favorite brands and clothing items. 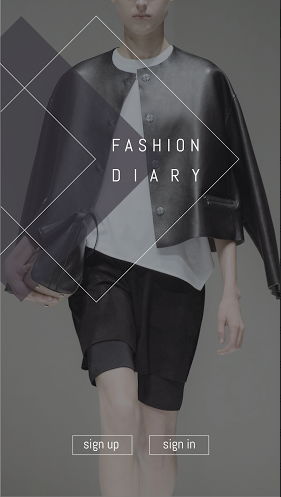 Similar to photography based applications, Fashion Diary has a newsfeed for its users that is customizable based on which profiles the user chooses to follow. We wanted to create a more unique newsfeed focused around visual elements. We designed an asymmetrical feed with diamond photographs to simulate a more dynamic layout.